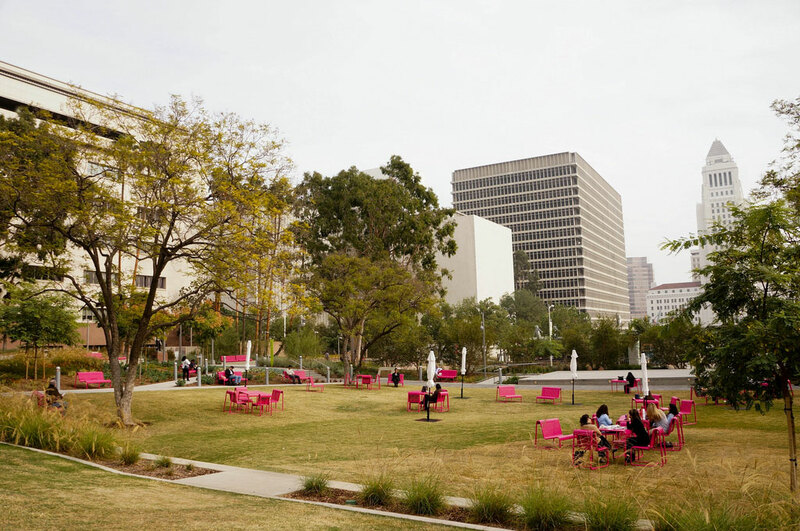 The designers of Grand Park, Rios Clementi Hale Studios, expressed the multiculturalism of Los Angeles though the colors and textures of flora and fauna drawn from across the globe. To represent the many cultures that have settled in Los Angeles, the park’s plantings showcase species from each of the world’s six floristic regions. Magenta pink emerged from a shared theme of bright floral colors found in many equatorial nations. 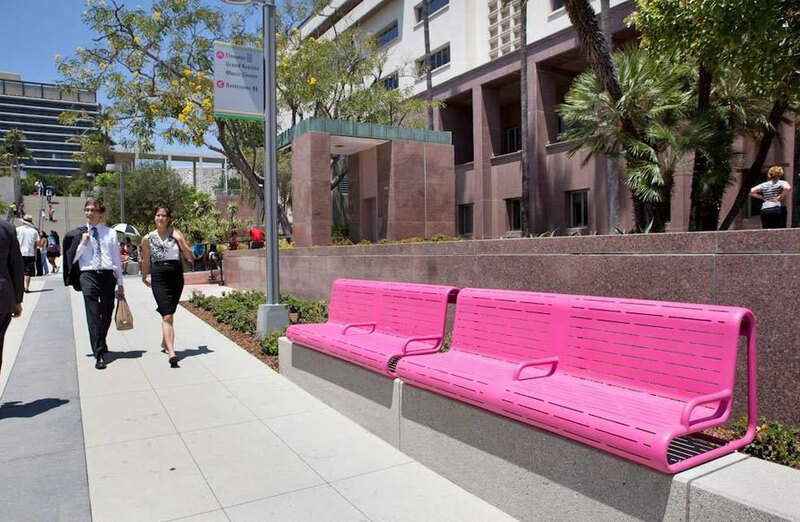 The designers rejected ordinary street furniture colors and instead created custom benches and chairs in the bold, rosy hue to reflect the park’s central theme of multiculturalism. The bright color plays a significant role in defining the park’s identity, branding and event marketing. In this important public gathering place, color is successfully used to symbolize the city’s cultural diversity while creating an identifiable, signature urban aesthetic. The results are an exuberant celebration of color, culture and community. Indeed, a Grand Park for everyone. 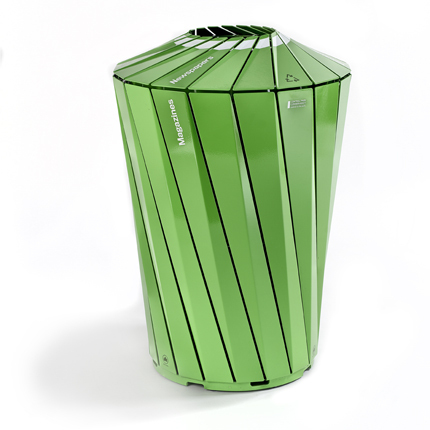 This trash receptacle is among the designs being rated by the public for the Silver Spring Streetscape Standards. In developing streetscape standards for downtown Silver Spring, the Montgomery County Planning Department has asked the public to choose their favorite designs for the benches and trash receptacles to be specified in the standards. Sample designs were installed during the summer in Royce Hanson Park next to the Planning Department so they could be experienced. The survey results will inform planners and decision-makers about public preferences in their efforts to improve the spaces between buildings and streets in Silver Spring by updating the streetscape standards and helping designers choose consistent street furniture in the future. Color’s versatility makes it an ideal medium for civic participation, presenting opportunities to express Silver Spring’s culture, place, history and identity through different hues. Vivid colors could be applied to the gateway areas of downtown Silver Spring to highlight their role of transition and arrival. 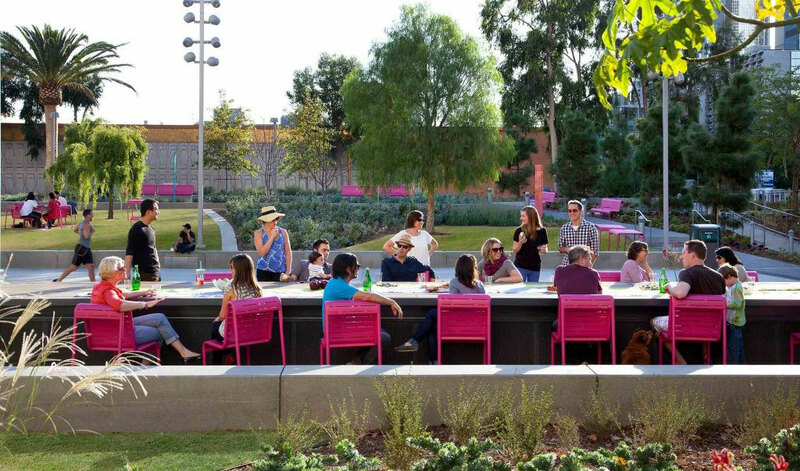 Planners and the public should take inspiration from Grand Park and consider color as an important contributor to the design, meaning and experience of public spaces. 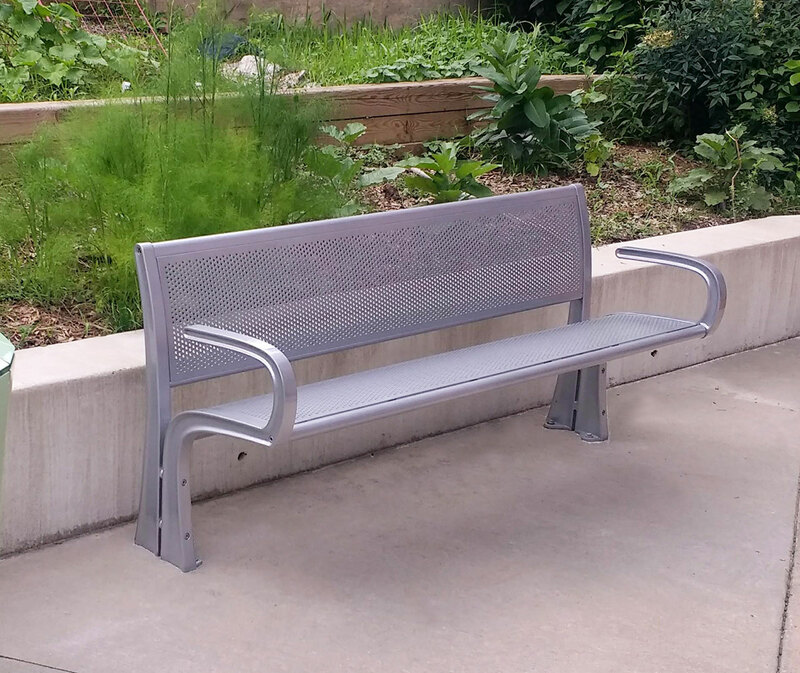 Among the furniture being considered for the Silver Spring Streetscape Standards is this cast aluminum bench. Yes! Love, love, love color in public places. Thanks for paying attention to this important design feature.